First came Body for Life. Then every other supplement company started their own Transformation Contest. But this is the first time a scientifically proven fat burning workout program has held a transformation contest. Men's Health expert trainer Craig Ballantye, the originator of the fat burning workout routine, Turbulence Training, is offering $2000 cash to the top prize winner in his 12-week Turbulence Training Transformation program. Already, dozens of men and women have entered the Turbulence Training 12- Week, $2000 Transformation Contest. There are young men from Holland, young women from the West Coast of Canada, a 64-year old woman from Belfast, Maine, plenty of folks from down under in Australia and New Zealand, and dozens more from North America and the UK. 2) You must keep a training journal in the Turbulence Training Membership forum (don't forget, you get 3 months free access to the Turbulence Training Membership site when you order Turbulence Training). 3) You must post before and after photos in your training journal in the TT Membership section. Your photo must include a newspaper from that day to validate your start and end date. In addition, your photo must include a headshot in order to qualify for the prizes. 4) The TT Transformation Contest runs from Nov. 26th to April 15th. All transformations must start and finish during this time period. Therefore, you could start as late as January 21st. 6) The Transformation Contest will be judged by a panel of experts, including but not restricted to: Craig Ballantyne, diet expert Brad Pilon, and female fat loss expert, Holly Rigsby. What is Turbulence Training? So many people want to know! 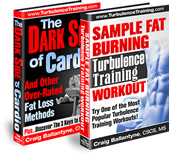 The Turbulence Training fat burning workout system can be adapted for any goal and any experience level. It starts with a bodyweight circuit to warm-up, rather than a slow, boring 5- minute walk on the treadmill. The bodyweight circuit prepares the entire body for exercise, whereas the treadmill walk obviously neglects the upper body. Next, it is onto the strength training, using the Turbulence Training principle of picking the most efficient and effective exercises. By using non-competing supersets, we allow one muscle group to work and one muscle group to recover. This increases the total amount of work done in the workout - also known as increasing exercise "density". Experts believe increasing exercise density helps burn more calories and helps you lose fat faster. Finish with 20 minutes of interval training for a complete fat burning workout in only 45 minutes. Interval training has been shown in Australian research to burn off more belly fat than normal cardio. In fact, interval training is one of the Turbulence Training secret weapons. Don't forget, the last day to start your Turbulence Training Transformation is January 21st, 2008. The Dark Side of Cardio... And Other Over-rated Exercise Methods. 1) Turbulence Training Fat Loss Nutrition Guidelines, by Dr. Chris Mohr, Ph.D.
You need to eat right to lose fat, and this nutrition guideline shows men and women exactly which foods to choose, how often to eat, how much protein to get, and a shocking list of foods you MUST avoid to lose fat and improve your health. Dr. Chris Mohr, Ph.D., R.D., is one of the most respected Registered Dieticians in America, appearing on the Montel Williams Show, writing for Men's Health, Weight Watchers, and Prevention magazines. By combining a dumbbell exercise and a bodyweight exercise, you'll be able to do these Turbulence Training workouts even faster than ever before. Just wait till you try these workouts. You'll be blown away by the effectiveness of the dumbbell-bodyweight superset combinations. So fast, so simple, yet so efficient at burning fat. With both beginner and advanced versions, this program serves as a great add-on to the regular Turbulence Training program that hundreds of women have already used to lose fat and sculpt their bodies. All of these workouts can be done at home with a bench, a ball, dumbbells, and your own bodyweight. Burn fat, then build the muscle. Don't get caught without having a beach body. Once you lose all the fat you need, switch to this advanced muscle-building program to get the biceps, chest, and calves that will give you a "stand-out in the crowd" physique. Sculpt your body without the need for any fancy equipment or even a set of dumbbells. This 4-week program contains beginner, intermediate, and advanced levels so that no matter what your fitness level, you can get a complete Turbulence Training work anytime, anyplace. Take this one when you travel for work or holidays, and you won't come home with any extra "baggage". Just what the title says. I designed this program for a personal trainer that I was training (Yep, I'm considered a trainer to the trainers) and we needed to get maximum results in only 30 days. By choosing the exercises that gave him the most results in the least amount of time, he was able to impress his clients (and get more clients) thanks to his TT fat loss. The most challenging TT workout to date. This 4-week program combines advanced athletic moves with dumbbell exercises AND bodyweight exercises into one of the most intense bodysculpting workouts I've ever designed. Once you are finished with all of the Turbulence Training workouts, use this workout to build the body of your dreams in as little time as possible. WOMEN: Click here to discover the truth about cardio for fat loss, and why the two components of short, burst exercise workouts have been scientifically proven to better for fat loss and losing your belly fat. MEN: Click here to learn about the short workouts you can do to build muscle and burn fat at the same time, all while getting in and out of the gym in under 45 minutes only 3 times per week, so that you can get on to more important things in your life.